ConvertKit is the darling of the email marketing world at the moment – and with good reason. Up until now, it’s been impossible to find the level of automations, segmentation and email personalization that ConvertKit offers in such an affordable monthly package ($29 to start). But depending on your subscriber count, you’ll likely be paying than you’re used to, especially if moving over from a provider like Mailchimp. The whole point of switching over to a more powerful email service provider is to take advantage of it’s more powerful features, right? 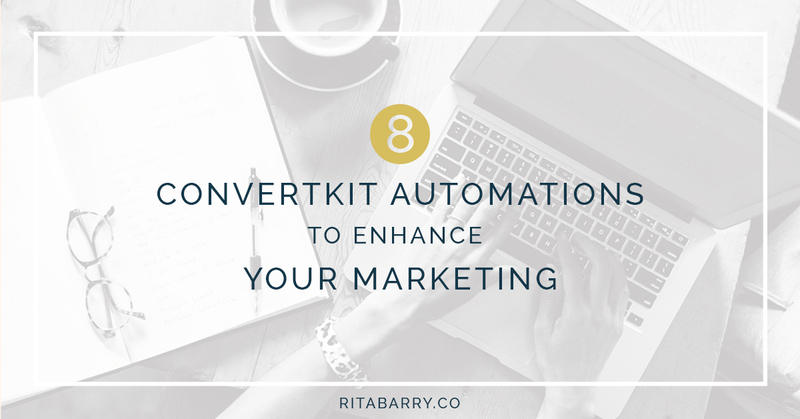 That’s why I wanted to walk through 9 different ways you can use ConvertKit automations to level up your email marketing, serve your subscribers better AND save yourself a lot of time. Before we jump into the automations, here’s a bit of an overview of how Convertkit handles subscribers, it’s a bit different than you may be used to. The “lists” are gone. They have been replaced with subscribers, you know, like real people. It’s rather refreshing. Each of those subscribers can have multiple characteristics assigned to them through the use of tags. One subscriber can have multiple tags. Like a tag that they have purchased a product from you, another tag that they are interested in a certain topic and yet another tag that they are at a certain stage in business. Basically tags allow you to collect subscriber information and then use that information to better communicate with them. That brief background should help all that follows make a bit more sense if you’re not a ConvertKit user. And naturally, if your email service provider isn’t ConvertKit but does allow for tagging, these automations will work for you too! Not only are lead magnets a great way to encourage people to sign up for your list, they also act as a natural segmenting tool. For example, if I had a lead magnet about list building and another about Google Analytics, I could automatically “tag” a subscriber as interested in those respective topics by creating different tags in ConvertKit. i.e Interest: List Building, Interest: Analytics. I can then use those tags to filter messages and send subscribers more targeted, topic specific emails and stay out of their inbox if the info isn’t for them. Plus, subscribers can have multiple tags! So if someone gets both lead magnets, they can be tagged both times. This Convertkit automation is a natural extension of #1. It’s when you send a topic specific email sequence to a person based on the lead magnet they signed up for. That person who wanted the list building lead magnet could receive an automated series of emails all about list building while our Google Analytics subscriber would be receiving an entirely different series with content geared to their interests. Providing subscriber specific content captures and keeps attention much better than generic information. And once you lose someone’s attention – it’s usually gone for good. A simple sales funnel, this automation is all about matching your subscriber’s problem with your paid solution. A subscriber opts in for your lead magnet that addresses a specific problem or concern and then they receive a series of informational and sales messages about the same issue. You have just created an automated sales person in your business! ConvertKit has a handy feature (maybe my favorite) called Link Triggers. This feature allows you to include links in your emails that trigger other actions in your ConvertKit account. It seems kind of basic that when someone has purchased a product, you don’t want to email them asking them to buy it, right? Has that every happened to you? I know it’s happened to me and when using different email providers, I know I was guilty of this too. ConvertKit makes it very straight forward to tag someone as a customer and then you simply configure all messages in your automation sequences to exclude that tag. Once again, better subscriber experience, totally on autopilot. Just as you can set up automations to know if someone has purchased a product, you also know when people haven’t purchased at the end of a promotion. This knowledge allows you to do a few different things. You can offer a lower cost trial if you’re selling a recurring product, you can offer a related product or you can simply provide a survey to gather information about why the subscriber didn’t buy. The same as with the downsell for non-buyers, an automated upsell is also a great strategy to test. Do you have a great complementary product that would enhance what they just bought? Could you offer a coaching upsell to a digital product or an add on that can help a customer get their desired result faster or easier? For example, you send 3 emails as part of a welcome sequence and within those, you could ask a subscriber to let you know what topics they were interested in learning more about (you’d use Link Triggers for that). Then, when that welcome sequence is done, you can set a ConvertKit automation to move them to another email sequence based on their expressed interests! That email sequence could sell them a solution to their problem or be entirely information. Then the subscriber could return to another more generic autoresponder sequence. Imagine how engaged a reader would be if they received such customized email communication! And don’t worry, you can add a ConvertKit automation to block a user from receiving regular “broadcasts” while they’re in a special sequence, this is great to keep them from getting too many emails or getting something off topic! What’s one email automation technique you’re going to implement this week?